My four year old daughter NEVER does anything like the other kids. 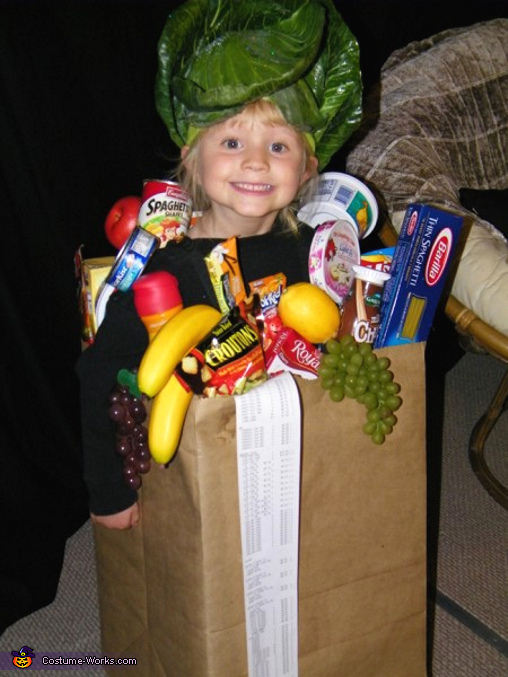 This year I thought she would like to be a princess or a witch but no, she wanted to be a BAG OF GROCERIES for Halloween. She has a very creative mind but I am the one (her mother) that had no choice but to become creative when she came up with this idea for Halloween. How on earth will I be able to make her a bag of groceries? So we started with a cardboard box, which is one of the best resources for Halloween... Lots of HOT GLUE, clear spray & duct tape! We collected used grocery items to fill the bag, we made sure they were empty and not see through. We glued them back together to looks like brand new. Also we bought fake fruit at the dollar store. We attached elastic to the cardboard box to fit my daughter's height and made her walk around to see if she felt good. Then we hot glued and taped all the groceries into place all around my daughter making sure we left room for her to fit the whole thing over her head. She wore a black shirt so she would blend in, we put a few pieces of Velcro on her shoulder and attached a few cans to fill in the blanks and make the bag look FULL! Once the bag was full of groceries we covered the box with brown wrapping paper, the kind used for shipping packages. We folded it to look like the creases in a real grocery bag and taped/glued it in place. We took an extra long receipt and attached it to the front of the bag. The "Head of Cabbage" was the icing on the cake. It is made with a REAL cabbage! First I took the leaves off and cleaned them, after we sprayed them with clear acrylic spray to make them a little hard and shiny. Once they dried we placed them on a green knit hat and glued, safety pinned and sewed them on the hat. To finish it off we sprayed them with spray glue and sprinkled fine silver glitter on to give it a wet look. With that, my little bag of groceries was complete. She was the talk of the town and the cutest bag of groceries I’d ever seen. This is so ADORABLE! I am trying this for my son.. a little confused on how you managed to get the box to stay on.. hot glue? id fear that it would all fall halfway through the night! You certainly have a gift! !